I remember when I heard Spock’s Beard for the first time way back when I wasn’t really blown away by them. Mind you, I enjoyed their CD’s enough, but they just didn’t seem to have any “magic” to them. Then I saw them live and suddenly everything clicked. I “got” Spock’s Beard. From that point forward I was at a different level of enjoyment when I heard their CD’s. Well, for those who haven’t been fully bitten by the Beard bug, this DVD is quite possibly the prescription for what ails you. The sound quality and videography are both quite strong on this release, but honestly those elements take the back seat to the performance of the musicians. These guys are some of the best in the business and this DVD shows it. Fortunately the camera operators and editors chose to refrain from all the fast paced switching that is so common in concert DVD’s these days. Instead they seem to be quite familiar with the set, showcasing the important sections at the right times. 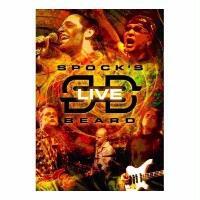 Those who stick to the Neal Morse era of the band and think that this incarnation of Spock’s Beard isn’t the real deal would do well to check this out. I challenge anyone to view this DVD and say that this band isn’t at least equal to the Beard of Neal Morse’s tenure. This is just plain a great concert document and sure to be one of the best of the year. So, what are you waiting for, get out there and pick it up.